Please do not use my photos without permission (even the watermarked ones). If you wish to avail of my non-watermarked images, you may contact me for a copy. See my Contact page for details. 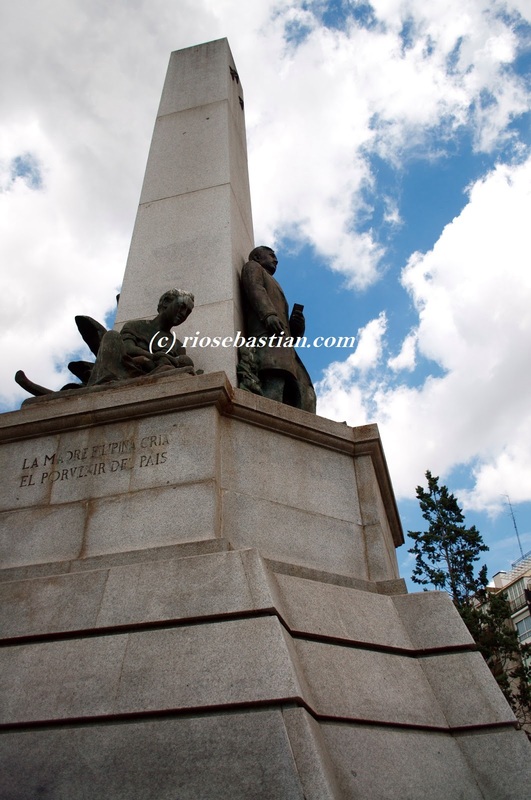 As promised, I went to visit the historical places in Madrid that has to do with Jose Rizal. Before going there, I have printed this useful file that you can get from the web site of the Philippine Embassy in Madrid. I tried to contact the historian Jaime Marco, the author of this document to know more about it. He was quite friendly and willing to meet and tour me around. Unfortunately, he's only available during the weekend, and my trip schedule fell on weekdays. I was able to see most of the places in the list in such a short time because they were mostly located close to each other. First off, I went to Avenida de las Islas de Filipinas to see Jose Rizal's statue. This statue is just like the one that we have in Luneta (Rizal Park) in the Philippines, only smaller. It is quietly located outside the city center, far away from the tourist sites. You will find it just at the beginning of the Avenida de Filipinas, about 500 meters away. Jose Rizal's Monument is right at the corner of Calle Santander. Seeing it made me feel as if I was back at Luneta Park again. It is the exact copy, except that this replica is a bit smaller and there were no guards on either side of the statue. On one side of the monument, you will find his famous poem, Mi Ultimo Adios (Last Farewell) in the original Spanish version and the Filipino translation on the other side. I was blessed with a really warm sunny weather in Madrid. From Avenida de las Islas de Filipinas, I took the Metro towards Sol station. I had to make two transfers, I think. Exiting the Sol Metro Station brings you to Puerta del Sol. 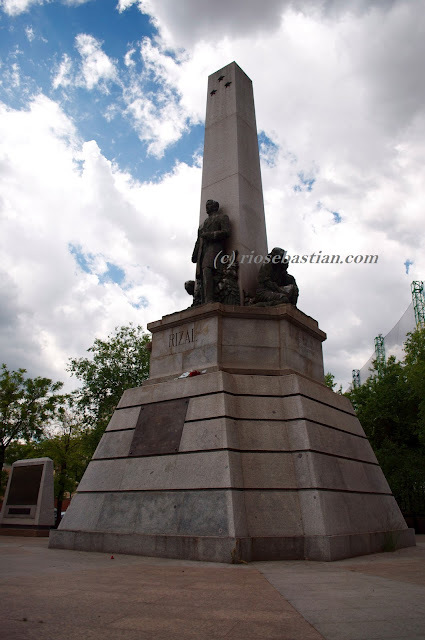 From there, you walk towards Calle San Jeronimo, and there you will find the streets that lead to Jose Rizal's old apartment, and the places that he used to frequent with Juan Luna and all his other friends. Walking the streets of Calle Echegaray leads to Hotel Ingles, where the Filipino community in Madrid celebrated their most important events, according to the Philippine Embassy's document. I was hesitating to go inside Viva Madrid. there didn't seem to be a lot of people as it is still early evening, and it was a weekday. This area is lined with a lot of nice restaurants and bars actually. It's not so far away from where I was staying. I went farther down towards Calle del Prado to see Ateneo de Madrid, where Rizal studied English. Still farther down towards Calle Atocha, I went to see where used to be the publication office of La Solidaridad, the first ever Filipino newspaper. I found out that it is now a tapas bar undergoing reconstruction inside. Not a very pretty site, but I was still so much in awe and felt really privileged to have seen and visited the place. It felt so surreal to me, walking around the areas in Madrid where Rizal had walked a century before. it made me feel like I was transported back in time. It was more than marvelous. I thought your postings on Rizal were quite brilliant and very inspirational. It was refreshing to see another person who was also interested in Rizal, to the point that she is tracking the places that Rizal visited or stayed in. And now I find myself doing the same pilgrimage, having just visited Litoměřice in Czech Republic and afterwards heading to Heidelberg. Unfortunately for me, this idea did not enter my mind until a couple of years ago, and so I would probably have to backtrack and revisit a number of places such as Paris, Geneva, Vienna, Brussels, Ghent and so on for the Rizal connection. Et maintenant? I don't know what happened to your posts :( If one reads the biographies of Rizal, I doubt one would ever imagine him indulging in materialism and showing off. (He was in fact barely getting by, having to borrow money from people in order to publish his book--note however that I'm not at all suggesting one should live exactly like him). Anyway, if you have not yet visited Litoměřice, please do. Also stop by at the Tourist Information center. They are selling a book on Rizal and Blumentritt, written by the town historian. It doesn't seem to be put on display so you will have to ask for it, unless they immediately perceive you as a Filipino and offer it to you. Hello, Anonymous! Your French is alright. ;) Thanks a lot for the Jose Rizal travel suggestions. I will make it a point to visit Litoměřice in Czech Republic. I've always wanted to visit Prague. Maybe I will do that next year. I am definitely slacking on following up on the Jose Rizal posts. Hi Rio. I'm writing this in a hurry as I have to ship out again and I'm not sure how reliable the internet connection will be at my next location. I have quite a bit of stuff to say about the good doctor but no time for that now. Just want to say I appreciate your reply and oh, happy anniversary. Au revoir. Hello again! Please do tell me more about your thoughts/opinions about Jose Rizal. I think the other readers, especially those doing research will benefit from this also.